Though we live in the high desert, it does rain torrentially sometimes, so we wanted to set up a rain collection system for the vegetable garden that we expanded last year. Though the system consists of nothing but gutters and a rain barrel (or a poly water tank) , setting it up does take some calculation. 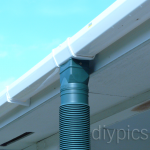 In our case, for example, I wanted the barrel to be on the east side of the porch, but when we checked the slant of the roof, it would have been impossible to install the gutters in such a way that they would slant to the east. 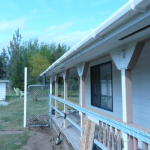 So we had to settle for placing the rain barrel on the west side, taking advantage of the natural slant of the roof and adding a little more slant by installing the gutters a bit high on one end to a final “low” point on the far end. I bought the rain barrel with an installed spout from a local guy and added a loosely-fit funnel with a wire mesh filter to the top of it. Ideally, I should remember to take the “input” funnel out for the first couple minutes of a rainfall to avoid the dirtiest water, but I don’t. As we live somewhat in the country, I don’t think the dirt from the roof will do the vegetables harm anyhow. Once the rain barrel fills up, the excess rain just pours out of the loosely-fit input funnel. 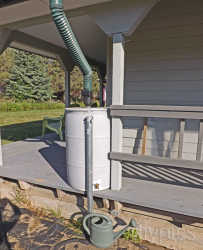 When we want to water with rainwater, we just put a watering can under the spout and turn it on. If you live in Colorado, be aware that collecting rain (or snow) water is illegal without a permit. You do not have the legal right to use the water, as it belongs to those downstream of you who own the water rights. Wow, I had no idea. Sounds preposterous to require a permit for a barrel’s worth of water. Do you need a permit to breathe the air in Colorado?